Season 3 of Boardwalk Empire premieres tonight on HBO, and if you were a fan of season 1 and season 2 then you’re definitely not going to want to miss this action-packed episode! Tonight’s episode, which is entitled “Resolution,” deals with Nucky’s New Year’s resolution, Van Alden taking a risky move by calling out a bluffing gangsta, Margaret thinking about a hospital expansion, and Gillian putting a new business plan into the works. HBO recently released some pretty good clips to get you all pumped up for the premiere. 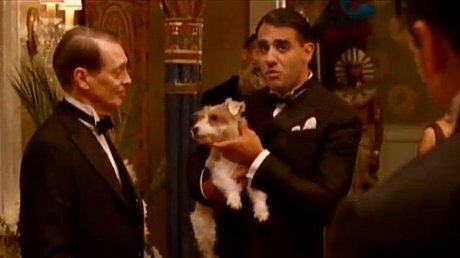 The first clip, which HBO has cleverly (not so cleverly) titled “Gyp Rosetti arrives at the New Year’s Eve Party,” features Gyp at the New Year’s Eve party carrying around a pretty fantastic looking puppy dog. Apparently, Nucky thinks it’s all right to give Gyp’s cheek a good squeeze-and-pull before having to leave the conversation. Hmm . . . don’t think he particularly enjoyed that one. In the second sneak peek scene, which is (also cleverly) titled “Capone and Van Alden,” we are taken into a flower shop — the perfect setting for a sketchy gangsta meet-and-greet, right? There’s a lot of tension and conflict in this scene and, while I don’t think it gives too much spoilage, it gives a great taste for what tonight’s episode — and season 3 — might entail. Take a look at that scene below. Boardwalk Empire airs tonight (9/16) on HBO at 9PM EST, and it’s going to be so good you definitely won’t want to miss it. As you probably already know, the show has a stellar cast, which consists of Steve Buscemi, Kelly Macdonald, Michael Shannon, Shea Whigham, Vincent Piazza, and others. Let us know in the comments section below if you’re excited for tonight’s episode. If you want to chat with someone about the show, just leave your thoughts and opinions in the comments section below!